Go ahead, let your kids play with their food (just this once!). These Funny Face Desserts are as much fun to make as they are to eat! Snack time has never tasted so good. 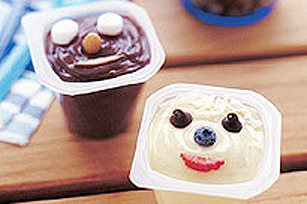 Make faces on Jell-O Ready-To-Eat Pudding Snacks, any flavour, with decorations such as cut-up fruit (apple wedges and strawberry halves), Baker's Semi-Sweet Chocolate Chips, peanuts, Jet-Puffed Mini Marshmallows or coconut just before serving. An apple wedge mouth, a strawberry sliver tongue, chocolate chips for eyes, a peanut nose and Miniature Marshmallows or shredded coconut for hair is just one "funny face" suggestion. Warning: small pieces may be a choking hazard for young children. Idea appropriate only for kids four years old and up.